Bolton Avenue in Alexandria is being renewed by the city as part of the Special Planned Activities Redevelopment Corridors (SPARC) initiative as highlighted in a recent newspaper article. Tomorrow, Friday 8/16, at 10 a.m. the city is holding a press conference in front of the Bolton Avenue Community Center. Be there if you can. Also, visit the Pill Box Pharmacy at the corner of Park Avenue and Bolton Avenue. It is in the former Greyhound Terminal which was originally the Park Avenue Branch of the Guaranty Bank. The building has been restored and was listed in January on the National Register of Historic Places. 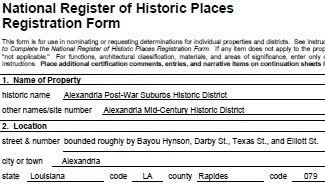 You may read a copy of the nomination to the National Register here. This building is described as being highly influenced by the architecture of Frank Lloyd Wright.